Auto struggles in Turkey: "We don't want any unions. We have set up workers councils"
The current strikes in the auto sector in the North-West Turkish city of Bursa raise many interesting questions of concern to both communists and militant workers in general. At the the of writing (18 May), there are four factories on strike, Renault, TOFAŞ (a joint venture with FIAT) Coşkunuz, and MAKO (both suppliers of automotive parts) supported by over 15,000 workers. The strike started at Renault on the late shift last Thursday (14th May), with the entire workforce of 5,000 joining as their shift were due to go on, and has since spread to the other three factories with further factories have declared they will join the strike within the coming days. The workers at all the plants have three main demands, the first being a contract the same as the one won by a threatened strike at Bosch in April including a 60% pay rise, the second that there are no victimisations of workers involved in the struggle, and the final one being the removal of the union Türk-Metal from their factories alongside the right to choose their own representatives. The city of Bursa is one of Turkey's most industrial cities, and is the main centre of auto production, which is Turkey's largest exporting sector, as well as being the home of many other industrial sectors. 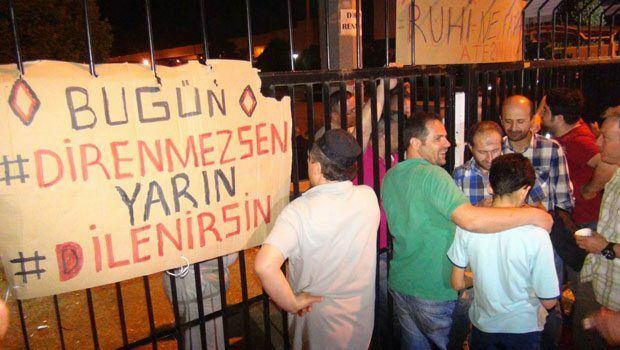 Workers in other factories in the city have supported the strikers with demonstrations, and there is talk of unrest in auto plants in the nearby city of İzmit. This has been a period of high tension in the Turkish metal industry with a lot of anger expressed against not only the main union Türk-Metal, but also against the smaller, more "left-wing" Birleşik Metal-Iş. Türk-Metal is often referred to as bloodsuckers by the workers, and the events at Bosch in April included the workforce resigning from the union to join Birleşik Metal, only to later rejoin Türk-Metal. Resignations from Türk-Metal at Renault began at the beginning of May, and led to a short strike, which ended in the reinstatement of 16 workers dismissed for leaving the union. January also saw a national metal workers' strike called by Birleşik Metal banned by the government as being against 'the national interest'. On the second day the union ordered the workers back to work though some workers continued to protest and struggle. Two things stand out about this struggle. The first is the way that it has spread rapidly across the sector, and seems to have mobilised the working class of the city as a whole. Many other plants have demonstrated and offered support. Strikers wives have demonstrated and marched to the factory. Obviously workers are stronger when they are fighting together. The dynamism of the speed at which this struggle is spreading is frightening both the management, and the state itself. The local governor has tried to intervene, and management at both Renault and TOFAŞ have declared a halt to production. The second is the complete rejection of the union. Türk-Metal is the biggest single Union in Turkey, and a member of Turk-Iş, the largest trade union federation. Even by the standards of the right-wing nationalist Türk-Iş confederation Türk-Metal is a particularly disgusting union with a history of using thugs to attack workers. The workers at Renault have set up their own committee with workers in other factories stating that the committee at Renault represents them all. This points to not only the workers taking the struggle into their own hands but also to a determination not to be divided plant by plant. The days ahead will see whether this unity can be maintained and whether the strike can continue to spread. The poster in the picture above the article says "If you don't resist today tomorrow you beg". Thanks for posting this Devrim, I think it's really important. After the protests in Turkey the other year, which seemed to be enmeshed with inter-party politics and campaigns around 'democracy' and 'citzenship', this is a very encouraging sign that the working class in Turkey is capable of fighting on its own terrain. I hope you can keep us up to date with what is happening. The intriguing thing in the above is that the workers had to go on strike to get 16 of their comrades reinstated because they had left the union. What does that tell us about the role of the unions in the management of labour here? Do supporters in Turkey of the workers' councils have any intentions of forming some sort of central leading workers' council, with a view to co-ordinating their struggles ? Just to be clear about we are talking about, these workers' councils aren't soviets. 'Council' is probably the best translation, but others are possible, such as 'board' or 'committee'. They are groups elected by the workers in the factory whereas the soviets in Russia in 1917 were delegate committees from groups elected by the factories. It's another lavel of organisation and development. Devrin has provided a clear explanation of two stages, or levels, of advance to power of, by and for workers. Without necessarily being specific to the situations within Turkey, how does ICT envisage and recommend possible next steps towards widely co-ordinating organisation(s) from such situations? Whilst rejecting any old notions of history being controlled by aliens(!!! ), it seems to me that the concept of interim workers' dominated states, whilst not yet fully socialist nor communist, deserves serious consideration. On the other hand, if you reject the need for states altogether, how else can any fairly large territory be run largely in the interests of workers ? We can hardly wait until a majority of workers has adopted a full set of ICT doctrine before edging towards power. Without any illusions, let's take another look at what is happening and at what Posadists have said and now say about Latin America. Interim workers dominated states, semi-states, dictatorship, these terms hardly mean anything without a workers movement to actualize them. There's so much more we're tasked with in the immediate time, but I guess holding this opinion makes me an opportunist, right? And to answer Cleish's question, it's just even more evidence of the total integration of labor unions into the state capitalist government apparatus, isn't it? I don't think the question of workers taking power in Turkey is on the agenda at the moment. Türk-Metal is the worst union in Turkey. It is effectively a gangster union. Jimmy Hocfa would blush at some of its behaviour. You can understand why the workers want them out. In in many ways this whole struggle is a revolt against Türk-Metal. As well as the places where there are strikes there are even more plants where workers are leaving the union enmass. Or anywhere else for that matter. Creating castles in the air about the current state of the global class struggle T34 is not much saner than flying saucers bringing us a superior mode of production from "out there". In reply to Cleishbotham's sneering comment of 2015-05-28 11:20, it would be more helpful to see any clear answers to questioning points so far made. If you want to focus our attention to whatever it is that you mean by 'castles in the air', perhaps you will kindly explain that too. I hope that you have recovered from illness you reported on your return from Milan. Thank you T34 as I have recovered (hence the post). The issue is perspectives. You are writing as if we are on the verge of such intense class struggle that revolutionary workers' organisations are on the agenda today. This seems to us fantastic. we make propaaganda for revolution but we are well aware this is not a realistic policy for now. We have a lot of work to do yet and the class has to move a lot further away from conformity with the status quo. You seem so impatient (are we not all?) that you don't seem to differentiate this. In reply to comment of 2015-05-28 23:40, there is a difference between holding and advancing perspectives, as compared with assessing what is going on and likely to go on so far as workers are concerned. Workers will always have to try to live within whatever status quos they find themselves, however much they wish otherwise. Whether or not I personally am impatient, and/ or hitched to what might be imagined as the verge of revolutionary agendas in general, will have little or no influence on the working class. Even if the ICT had all the resources of media for its prpaoganda, I doubt if that would result in torrential changes. Although imperialism prevails worldwide, there is still considerable uneven development from place to place, so any notions of spontaneously coordinated simultaneous global political revolution seem inapplicable so far. Some issues concentrate minds as matters of urgency, especially imminent prospects of war, so a combination of long term and realistic short term action to counteract what imperialism seems likely to inflict does paradoxically require impatience.